Casablanca is the largest city in Morocco, a place which is worth visiting. Probably you have this idea that Casablanca is a place where couples go because of its romantic ambiance and all that as depicted in the classic movie with the title “Casablanca” but in fact, there’s nothing too romantic about this place at all. You can compare it to any other city and won’t see anything better in terms of that. So, why was the movie so romantic when the city is not? Probably because Casablanca the movie was not shot in Casablanca at all but in fact, it was just shot in Florida. 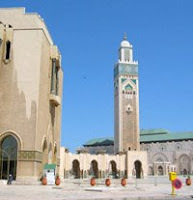 However, if you want to visit Casablanca, here's what you can see there: Hassan II Mosque is just one of the city's attractions. If you like the nightlife and shopping then this is a great place to go as well. It’s a typical industrialized and commercialized city but still it can’t compare to the neighbouring city of Marrakesh and Fez but nonetheless, it’s worth checking out to get some good purchases. If you’re already in Casablanca, go to Place Mohammed V is the centre square of Casablanca and it’s a nice looking architecture which is known as Mauresque and Ain Diab has several nice beach clubs and resorts but you need to have a good budget for your trip here as it can be quite expensive.